The Amston N99 dust masks are great for use at home or on the job, doing a wide variety of projects including carpentry, cleaning and sweeping, landscaping (mowing, bagging, blowing), chainsawing, grinding and many others. It is important to understand how to select the correct type of mask for your needs and to know how to properly put the mask on. It is very common for people to select the wrong type of mask or to put the mask on without achieving the proper seal. This can increase exposure or even render the mask useless. These masks are NOT certified for medical or surgical use, and all type N masks (N95, N99, N100) are not certified to offer protection against oil-based particulates. According to the National Institute for Occupational Safety & Health (NIOSH), the "N" refers to "Not resistant to oil". These masks are type 84A respirators with particulate filters. Respirator filters work by slowing down air flow so that smaller particles are trapped in the fibers of the filter. This means slower breathing is most effective, and filtering efficiency decreases with faster breathing. As a NIOSH-certified respirator, the Amston N99 mask, should form a tight but comfortable seal on your face, and it will not impair normal, relaxed breathing. NIOSH-certified respirator masks are classified as N (not resistant to oil), R (somewhat resistant to oil), and P (oil-proof). The numbers refer to the percentages of airborne particles the mask will filter out under proper use. 95 means at least 95%, 99 means at least 99%, and 100 means at least 99.97%. Your employer's designated respiratory protection program administrator can help you determine the right type of mask for your needs. BE SURE TO READ ALL WARNINGS AND SAFETY INSTRUCTIONS BEFORE USING THIS MASK. 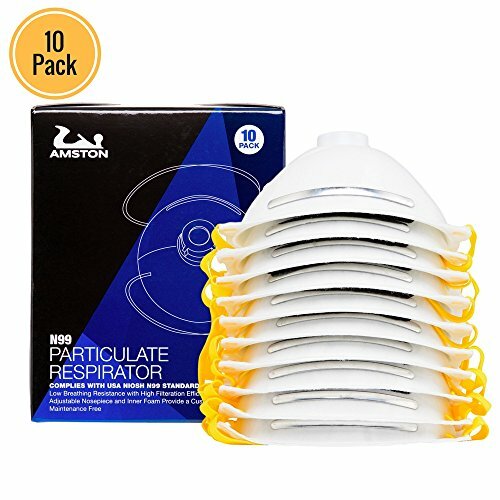 Box of 10 disposable, one-time use masks, lightweight and easy to breathe through. Maintenance free for indoor and outdoor use. National Institute for Occupational Safety & Health (NIOSH) approved, means the best way to protect yourself and your lungs. N99 masks remove at least 99% of non-oil-based particles down to 0.3 microns - including dust from sanding, sweeping, cutting, gardening, woodworking, grinding, sawing, and mowing. Adjustable, flexible soft metal nose clip provides a contoured, custom fit and helps comfortably obtain a secure seal to keep you protected from inhaling contaminated or toxic air, particles, allergens, pollen, pet hair and dander, mold spores, leaves, grass clippings, while working. Two elastic cloth straps allow for comfortable fit to keep you (and your lungs) protected for hours. For Professional and Home use. Low-profile design makes these easy-breathe respiratory half-face masks sluitable for use with other personal protective equipment / PPE such as safety helmets, hard hats, glasses, ear muffs, goggles other eyewear. If you have any questions about this product by Amston Tool Company, contact us by completing and submitting the form below. If you are looking for a specif part number, please include it with your message.